Cardiff Fire players. Pic: James Assinder. Cardiff Fire are out to complete a four-point National Ice Hockey League weekend when they entertain Bristol Pitbulls at the Viola Arena (6pm). Fire won 4-3 at Romford Raiders in a physical, bad tempered match which saw almost four hours in penalties handed out. Fire players Tom Smith, Lewis Stevens and Chris Fox were all given match penalties, while Raiders picked up the majority of calls. They were given more than two hours in penalties with fighting, checking to the head, leaving the bench and misconduct among the calls. Now head coach Mark Smith and his Fire team turn to their Severnside derby clash with Bristol in Cardiff Bay. That is certain to be another fiercely contested match. Fire recovered from two goals down to win against Romford in Essex. Raiders went ahead through Brandon Webster (4-03) and Ewan Hill (20-44) before the Cardiff visitors hit back. They scored three powerplay goals with Sam Bryant (2), Jackson Price and Josh Haslam scoring and giving Fire a 4-2 lead with less than 10 minutes left. Raiders scored a third to give themselves hope and pulled goaltender Bradley Windebank with just over a minute to go in favour of an extra skater, but Fire held on for a tough road win. 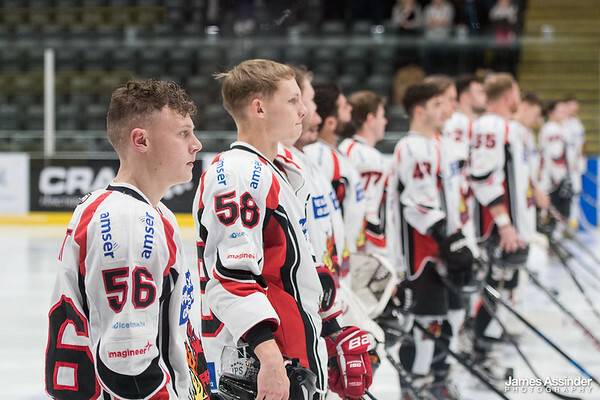 Fire are at home against next Sunday, February 24, when title-chasing Solent Devils are visitors to the Viola Arena (6pm). Saturday: Solent Devils 4, Peterborough Phantoms 2; Invicta 6, Lee Valley Lions 3; Romford Raiders 3, Cardiff Fire 4; Guildford 4, Oxford City Stars 5; Basingstoke Buffalo 2, Slough Jets 9. Sunday: Haringey Huskies v Romford Raiders (5.30pm), Cardiff Fire v Bristol Pitbulls (6pm), Swindon Wildcats v Bracknell Hornets (6.15pm). Scorers, Raiders: Ewan Hill 1+1, Brandon Webster 1+0, Daniel Hitchings 1+0, Tommy Huggett 0+1, Thomas Baptist 0+1, George Gell 0+2. Fire: Sam Bryant 2+0, Jackson Price 1+3, Josh Haslam 1+0, Elis Sheppard 0+1, Philip Manny 0+1, Tamas Elias 0+1. Period scores (Raiders first): 1-0; 1-2 (2-2); 1-2 (3-4). Shots on goal: Raiders (on Lewis Davies) 31, Fire (on Bradley Windebank) 39. Penalties in minutes: Raiders 123, Fire 106.